A second review requested by John Grimes, with thanks for donating twice to the Second Quinquennial Antagony & Ecstasy ACS Fundraiser. So as I sit here preparing to confront Giant Robo: The Animation - The Day the Earth Stood Still (and that's the last time we'll be typing that all out, thank you very much), the first question that I need to resolve is: how the hell do I exactly plan to do that? Giant Robo is quite a bulky thing, y'see, and not immediately classifiable. It's a seven-part OVA (original video animation), and the temptation to treat it as stand-alone episodes is strong; at the same time, the 338 minutes to which those seven hours add up (less 20 minutes or so of opening and closing credits, and "next time on..." bumpers) to have the very certain feel of one giant sweeping narrative, broken into seven parts for convenience rather than narratives structure. So that's what we'll be calling it: a five-and-a-half-hour movie released in chunks for reasons of digestibility and finance, with what must have been a rather painful 2.5-year wait in between the last two chunks. God, as a result what? Giant Robo is a wild patchwork, fearlessly mixing mecha anime, fantasy, and wuxia, all in a narrative that, when taken as one gigantic whole, has something very like the feeling of an epic historical chronicle. 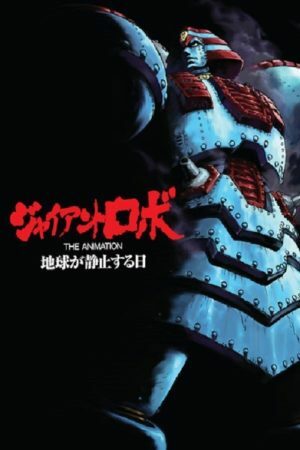 Individual characters come in to do their solitary acts of heroism and fade back into the grander backdrop, with the only strong throughline being the coming of age of one Kusama Daisaku (Yamaguchi Kappei), the boy who is alone able to control Giant Robo, a building-sized robot designed to look like an ancient Egyptian pharaoh. In its broad strokes, this is the story of a cold war in the faux-utopian future: a new form of alternative energy called the Shizuma Drive has, for ten years, so perfectly fueled the entirety of human civilisation, without any pollution or apparent side effects. And for ten years, everything was at peace, except that somewhere along the group, a terrorist organisation called BF Group came along to start raising hell, while the International Police formed a task force to oppose them. Both sides in this conflict have banked most of their strategy on a team of superhumans called Experts: the Magnificent Ten is the BF Group's team, and the Experts of Justice are the International Police answer. To them. Daisaku and Giant Robo are part of the Experts of Justice, working under the guidance of Chief Chujo (Kayumi Iemasa), and alongside a host of great heroes who belong much more the medieval world of wuxia than the sci-fi world of giant robots. Broad strokes are all we're going to have time for; Giant Robo is an enormously dense, I might even go as far as to say novelistic series. I think it's giving away nothing in particular to note that the Shizuma Drive is certainly not all that it is made out to be, and that the straightforward good/bad dynamic set up in the intial two episodes gets some increasing nuance as it goes along. The whole thing is a non-stop cluster of outright clichés, certainly not by accident: embracing clichés was precisely the insight that Imagawa had that made Giant Robo such a remarkable thing. This giant narrative sprawl, greedily snatching up characters who aren't nailed down and tossing them in, like so many toys thrown together arbitrarily into a sandbox, is nothing less than a tribute to the whole corpus of '60s manga and anime, celebrating every narrative trope that had been done to death 20 or 25 years before Giant Robo's first episode ever came out. This applies as well to the style: this is a very self-conscious visual throwback to the designs of '60s anime, done with with the loving care of '90s artists. I cannot pretend to be much of an expert on the matter, but I'll at least say that the contrast is quite visible, and grows increasingly effective as the series proceeds. In fact, that might be the most impressive aspect of Giant Robo: it keeps improving, episode by episode, all the way to the very end. That it took almost three years to complete the final episode, "The Grand Finale", must have been annoying as hell to people watching these as they came out, but there's no arguing with the results: "The Grand Finale" is a terrifically exciting hour of animation, using all manner of dramatic staging choices in what amounts to an episode-length battle sequence. The series's first evident use of computer-assisted traditional animation means that we get some impressively complicated, angular movements; a shot of Giant Robo emerging from the ground is kind of the perfect version of what a giant robot show should be, and it's not even the most exciting moment in the episode, which includes a forest of falling arrows among its more enticing visual conceits. But hell, that's all the way at the end - there's more than four and a half hours of stuff to get through first. Which is not chore; while Giant Robo ends on its best episode, its still a thoroughly enjoyable experience from the very start. Imagawa's insistence on old-fashioned design principles gives the series a distinctly dated feeling, but also an aura of classicism that suits it well. And even within the first episode, it's already playing around with the stylstic choices that will define everything to follow: multi-layer backgrounds that are more sophisticated than any random '60s anime project, expressive lighting that's substantially more sophisticated. And there are also the swerves into two variant aesthetics, for particular purposes: something that looks like pencil or charcoal on paper to punctuate the action scenes with particularly detailed, beautiful depictions of the characters, and black-and-white sequences with a dizzying strobe light effect to place us in the flashbacks to a horrible accident called the "Tragedy of Bashtarle", whose secrets are among the major mysteries teased out across the course of the series. None of this is showily handsome. Indeed, because of its particular artistic goals, being showily handsome was a theoretical impossibility. It gets close, by the end, but for the most part it's content to expertly execute a retro style with gracefulness and shading that would have been beyond all but the most enormously expensive anime prior to the early 1980s. There's an appealing cleanliness to how this aesthetic works in concert with the florid, highly elaborate concepts being depicted; it is an extremely clear piece of animation overall, which I've often found to be slightly or considerably untrue of anime. Mind you, five hours and some of any largely straightforward visual style can certainly get wearying (it's part of why I'm grateful that the last episode takes such a noticeable leap in richness and complexity; it's the only part of the series that fundamentally does not feel like it might have come out in the 1960s). And as much fun as it is to watch Giant Robo straight through, I'm not for, purely for reasons of visual stimulation, that I'd necessarily recommend doing it that way. On the other hand, it's such a wonderfully overwhelming story, and letting it plow over you in its unrelenting scope is a pretty great experience on its own. Honestly, I'm not certain how much of a handle on the narrative I've got; it's a dense, legitimately exhausting experience to watch it all, keeping track of all the ins and outs of characters and their relationships particularly as those relationships shift over the course of the show. What I can say is that it's a very rich mess, containing on the one hand a grand sci-fi epic narrative about the dangers of how the modern world exploits different energy sources and over-relies on them, a cautionary fable about the dark side of apparent utopias, and also a really damn strong story about its characters, and the fraught relationships between family members, particularly children trying to live up to their parents' aspirations (the series has a final dedication "to fathers and sons everywhere". But "to brothers and sisters" would been a strong contender as well, as would "fathers and daughters"). It's primarily in thinking about the characters that I reached for the word "novelistic"; there's something akin to War and Peace in the way Giant Robo telescopes between intimate moments and the broad shape of human history. And it fleshes out those characters, too: when the people we've gotten to know for some two and a half hours start dying midway through the series, those deaths have an impact that goes beyond the "killing people raises stakes" tricks of too much genre fiction. Plus, all of this is set to an absurdly great musical score by Amano Masamichi, drawing heavily from European opera (Donizetti, is directly quoted), giving an extra sense of grandiosity and heft above and beyond the scope of the narrative and the scale of the visuals. I'd even claim that the score is the best thing about the series; it is thunderous and overwhelming, giving the images more dramatic heft just by playing over them with Wagnerian force. Giant Robo is a great hulking thing, and by no means the most effortless anime I've ever watched. I do wonder how badly it needed be quite this long; the third, fourth, and fifth episodes in particular feel a little sealed-off from each other at points. Still, you have to give credit to a good sprawling epic; there's something enormously satisfying at getting clobbered in that way that only this many hours of content can do. I'm not quite sure how much of a reputation it has; I only heard of it for the first time because of this fundraiser, though I'm no anime expert. But if it doesn't have a strong reputation, it deserves one, and it's an easy recommendation for anybody with more than a passing interest in the medium.